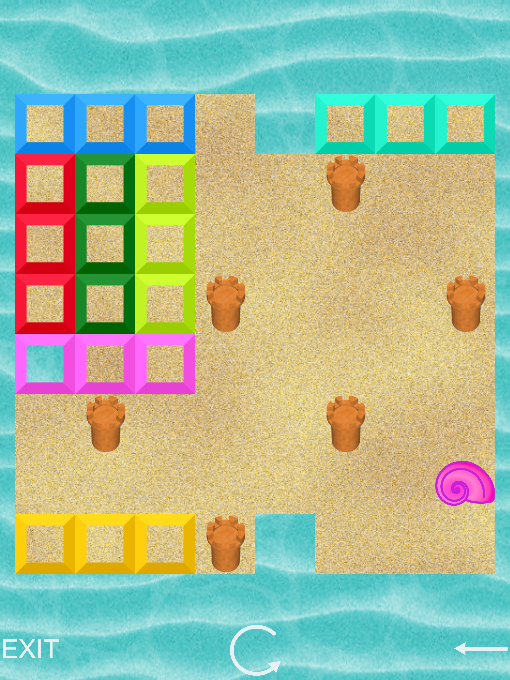 A 30 level puzzle at the beach where you dig in the sand such that each sandcastle is on its own island and all seastars are in the water. Requires Android version >= 4.4. This is just the web version wrapped utilizing Crosswalk so quite huge memory footprint. 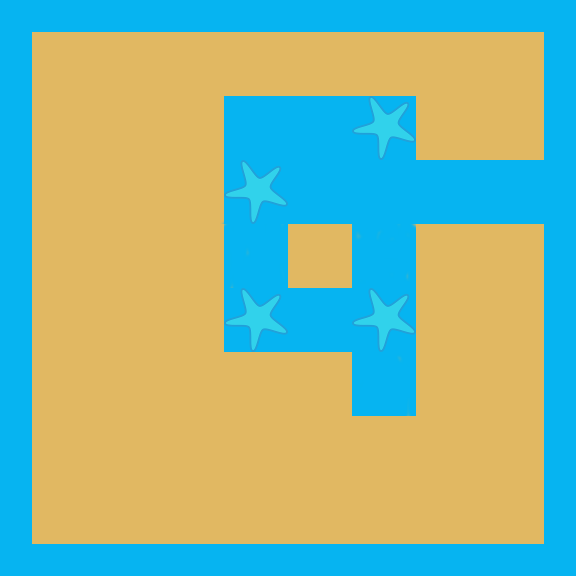 Play it in WebGL capable browser (there is a canvas fallback). 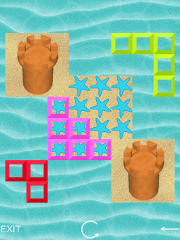 Dig water channels such that each castle is on its own island. 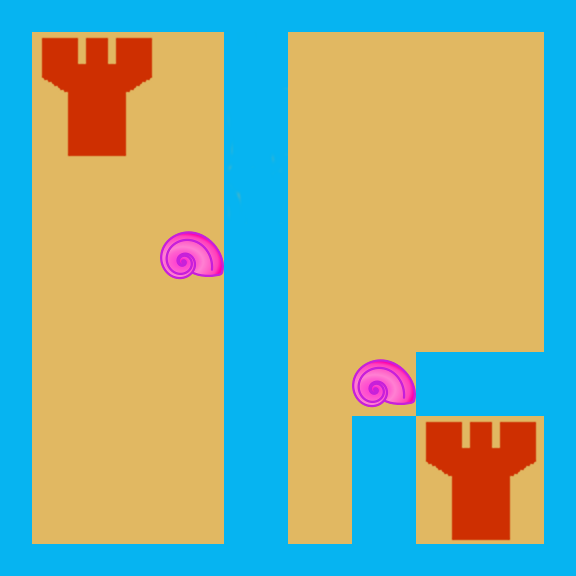 Put all seastars in the water by digging water channels at their positions. 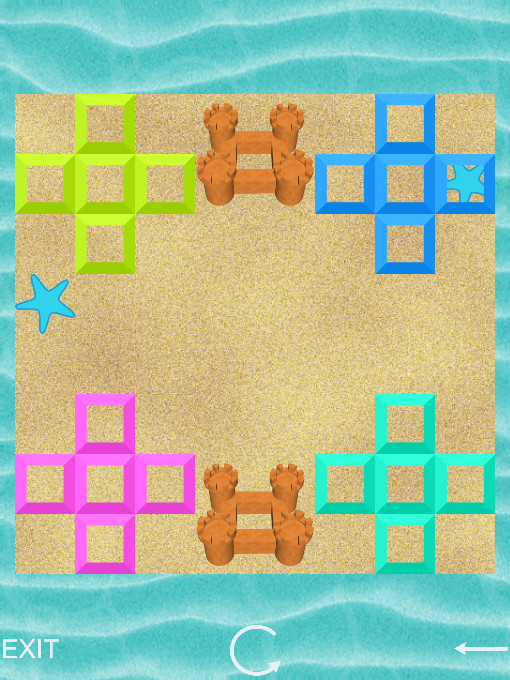 The playfield is a 8x8 grid. Outside this grid is water. You slide around geometric shapes. Where these shapes cover sand the digging takes place. 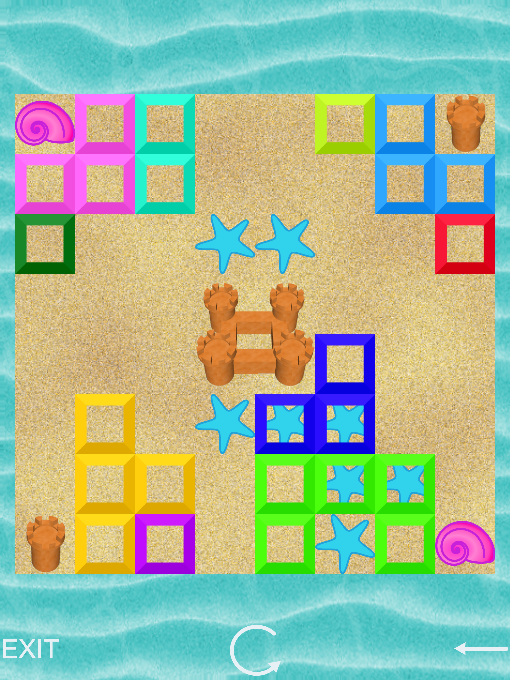 A level is solved, if through the current diggings, the tasks 1 and 2 are fulfilled. Then, where the digging tapped water, the channels are filled. 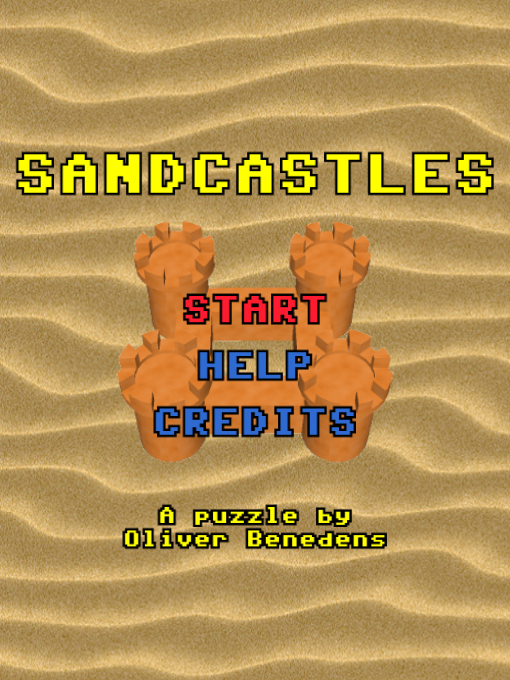 In this example there are 2 sandcastles. The light green shape is moved downwards. 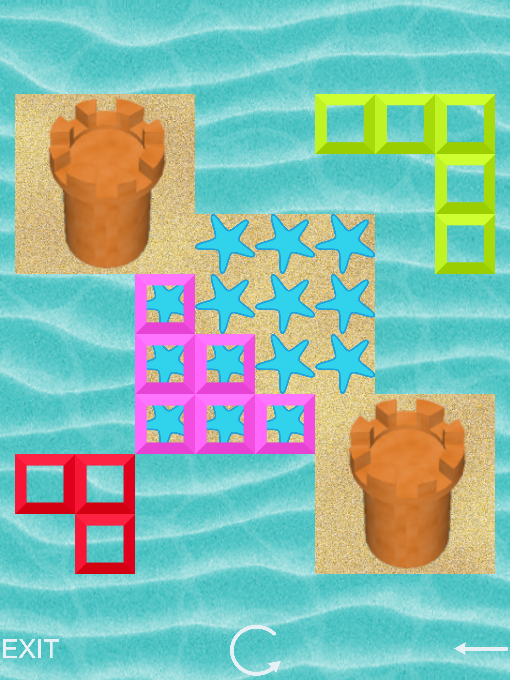 The result is a channel around the lower right castle which connects with the water from outside the playfield and both castles are on their own island. Again, note that you do not see the effect of the diggings until a solution is achieved. 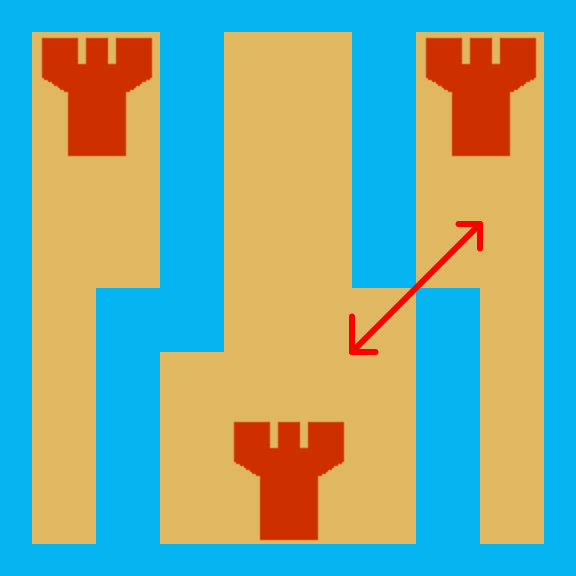 Two water channels connecting at a single point can be crossed. There is no water flow through this single point. 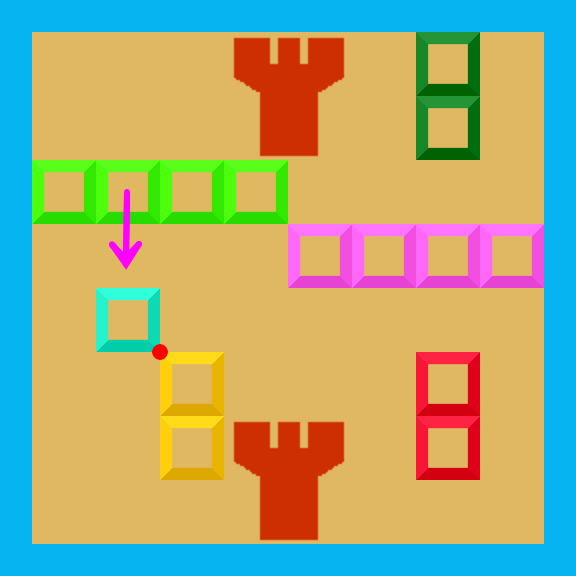 Because of this rule, the middle and right castle are on the SAME island because the path marked red connects them. 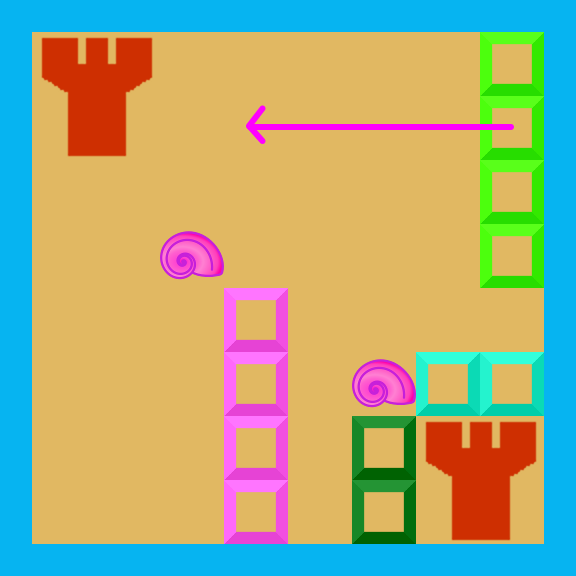 Sliding the light green shape downwards causes both castles to be on their own island and the level is solved. 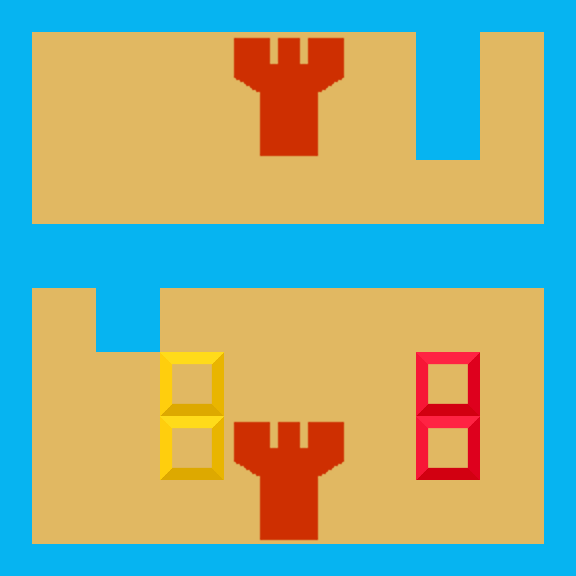 It is interesting to note which diggings fill with water: The yellow dig shape is connected to the cyan shape in only one point. Therefore no water from the digging of the cyan shape reaches it. 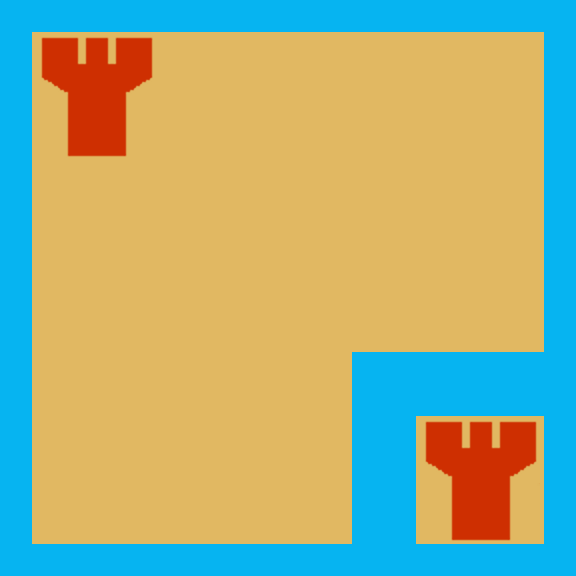 The red dig shape is not connected at all to water. 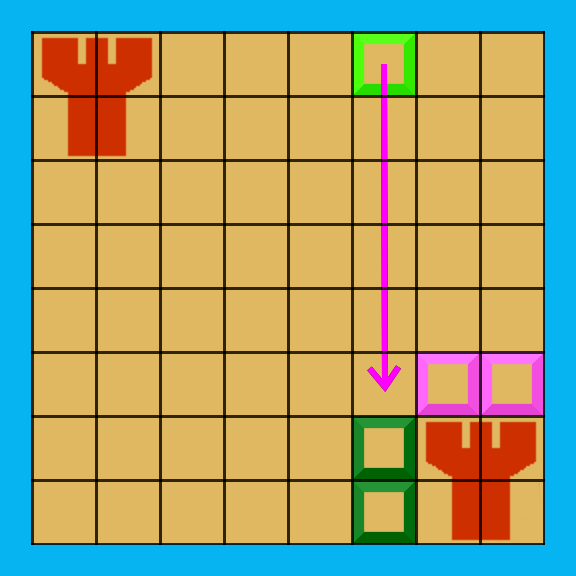 Sliding the light green shape to the right causes digging at all seastar positions. Note that in this level there is an already present water channel which is tapped by the diggings. 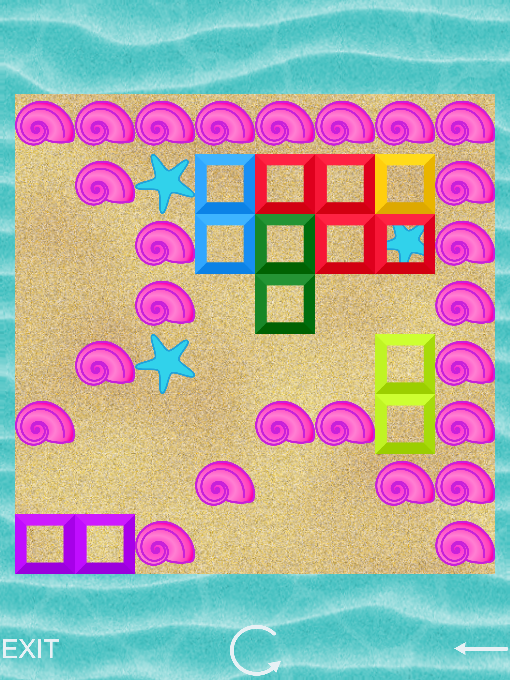 No digging is possible at seashells. 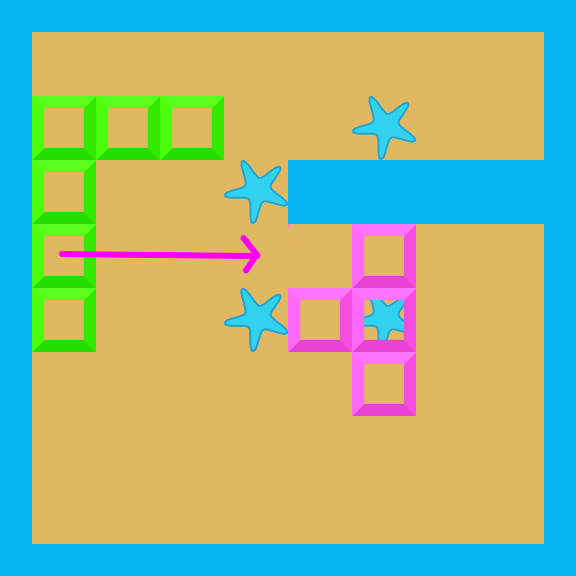 They stop movement of shapes and they can be crossed. 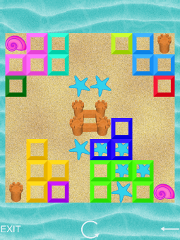 Sliding the light green shape to the left causes each castle to be on its own island. 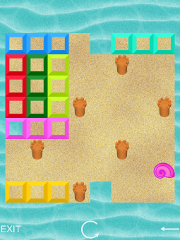 You move the digging tiles by mouse or touch. You click/touch them and flick them in the desired direction. The game cannot be played with keyboard. 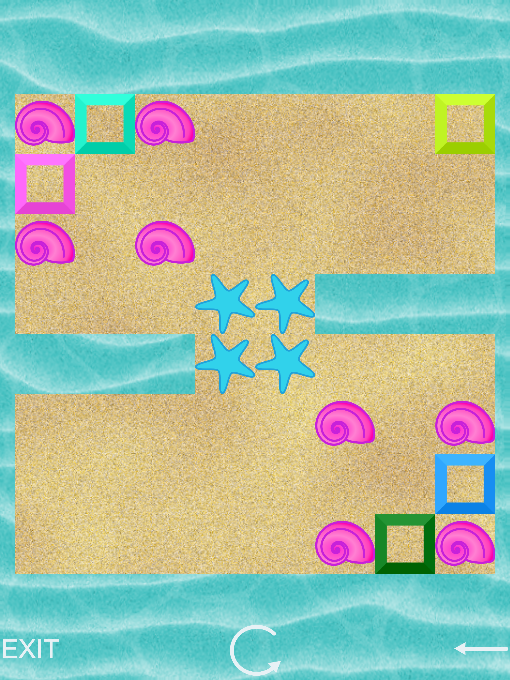 In a level, at the bottom of the page, there are three icons to be clicked/touched: Exit the current level, reset the current level and take back a move. Some levels have only one solution, other levels have multiple solutions. 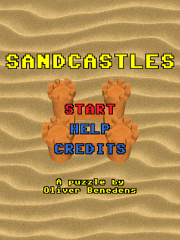 If you think a level is unsolvable, find the solutions here.